Calendula, or Pot Marigold (Calendula officinalis), is a great plant in both seed and flower. 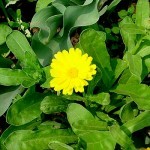 TJ sowed “Marygold,” an old name for Calendula, on April 2, 1767, at Shadwell. The seeds have a rather interesting shape: they resemble cat’s claws, according to a longtime Monticello groundskeeper. Showing a preference for cooler temperatures, the cheery yellow flowers of the annual Calendula brighten up the spring and fall garden. As a bonus, the flower petals are edible and make a lovely addition to salads. Calendula’s medicinal properties have been recognized for centuries, and the flowers were once used to dye food and fabrics yellow. It can also be used to make a healing salve. The Shop at Monticello offers seeds that are a representation of the species or wild type of Calendula with its single yellow and orange flowers. Plant the seeds in a sunny or partially-shaded site in the early spring to achieve a showy display before the hot temperatures of summer. Thin seedlings so they are six to twelve inches apart. There are approximately 20-30 seeds per pack. You can also enjoy Calendula in Petal and Vine Botanical Wax Sachets or plant the seeds as part of the Monticello Children’s Garden Kit. 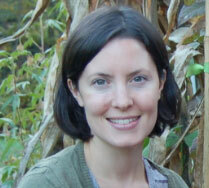 Lily Fox-Brugiere is the Garden and Outreach Coordinator for The Thomas Jefferson Center for Historic Plants. The CHP, established at Monticello in 1987, collects, preserves, and distributes historic plant varieties and strives to promote greater appreciation for the origins and evolution of garden plants. The program centers on Jefferson’s horticultural interests and the plants he grew at Monticello, but covers the broad history of plants cultivated in America by including varieties documented through the nineteenth century, and choice North American plants, a group of special interest to Jefferson himself.